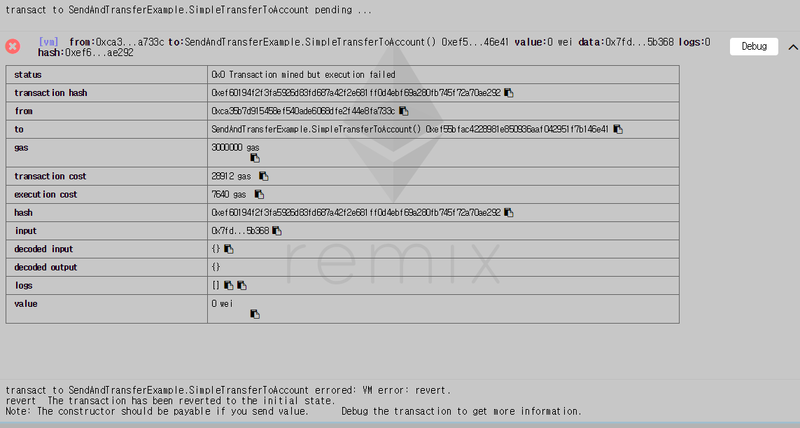 transact to SendAndTransferExample.SimpleTransferToAccount errored: VM error: revert. revert  The transaction has been reverted to the initial state. Note: The constructor should be payable if you send value. Debug the transaction to get more information. I have no idea what was wrong. Seombody help me please. A constructor() function which runs only once, right when the contract is created. You can use this function to initialize variables, like who the owner of the contract is and other global values. In this case, we made the function payable, which means that it can accept ETH. So during the contract creation, you can pass ETH as msg.value and the upon contract creation, the ETH will be accepted into the contract as part of its balance. A fallback function (function()) which runs whenever you call the contract, and none of the other functions match the function identifier, or when no data was supplied. This means that you can simply send ETH to the contract, and because the fallback function is also payable, it will accept that ETH. Using either of these functions, you should be able to send to your contract enough ETH such that your other functions will work. You should spend some time reading the solidity documentation which goes over both of these topics and much more! Your method should payable to send ether. N.B. address.send(value) and address.transfer(value) both are same except send doesn't throw exception on failure and consumes all of your transaction fees and transfer throw exception. Not the answer you're looking for? Browse other questions tagged solidity blockchain remix gas addresses or ask your own question. what are the diffrences between <address>.call and <address>.<function name>?